The Nanovic Institute is deeply saddened by the passing of Olivia Remie Constable on Wednesday, April 16, 2014. A fellow of the Institute for many years, Remie took a group of students to Spain during fall break (October 19-27, 2013) with her colleague in Art History, Danielle Joyner, to study the Camino de Santiago de Compostela in its medieval and modern dimensions. She was deeply committed to providing a rich and engaging educational experience for her students. Moreover, Remie did not just want to pass along knowledge to her students while abroad: she wanted the experience of international learning to transform them. As she described preparations for the trip, Remie sat in our offices with her perfectly straight posture, utterly convinced (and convincing) that the trip would bring the past and present together in a way that would take the subject of pilgrimage far beyond the notional and disciplinary. She was right. She rhapsodized about what it was like to see medieval history come alive in her students’ eyes. She spoke excitedly, and with pride, about her students’ interest in topics they had never considered before. Her sincerity and enthusiasm could barely be contained. Danielle Joyner looked on, beaming. It was clear that an academic partnership was also part of a deep friendship. The university has lost a leader of great historical imagination and erudition. The Nanovic Institute wishes to extend its deepest sympathies and prayers to Remie’s family, and to all who have had the pleasure and honor of working with her. She will be sorely missed, but her spirit will continue to accompany and inspire all who knew her. Buen camino, Remie. 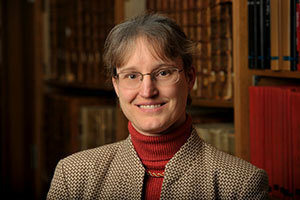 Olivia Remie Constable, Robert M. Conway Director of the Medieval Institute and professor of history at the University of Notre Dame, died of cancer at home Wednesday (April 16). Funeral services will be private. A public memorial service will be held at 3:30 p.m. May 21 (Wednesday) in the McKenna Hall auditorium on the Notre Dame campus. The service will be followed by a light reception.